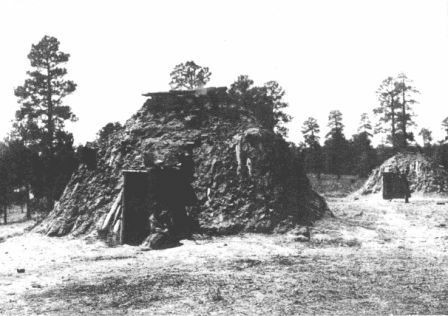 A Hogan House was the name of the traditional semi-subterranean shelter or house style that was used by the Navajo Native Indian tribe. The Hogan was built to a specific, predetermined plan and were used as both a home and a center for religious ceremonies and rituals. 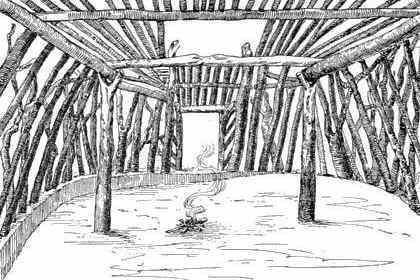 The main timbers used to construct the Hogan were from the piñon pine tree that was native to Arizona, New Mexico, Utah, and Colorado where the Navoho tribe was located. Learn about the structure and the interior of the Hogan House with pictures and images together with interesting facts and information. When a Hogan House was built there was a ceremony of dedication. The woman would sweep out the house with a wisp of grass and a fire was lit on the floor directly under the smoke hole.